Join us at 7pm for the unified prayer meeting at the Howell Township Municipal Building. Men 16 and up be a part of the Cornerstone Men’s Softball Tea for a great season of fun and fellowship. Join the challenge! Read the Bible together. Commit to read through the New Testament, about 2 chapters a day, in 6 months. Calvary Chapel Vineland's 2019 South Jersey Women's Conference is here once again with Guest Speaker Inga- Lill Guzik. Click here to find out more. Pray about being a part of this trip by going or supporting others who will be going. Sign up if you are interested in this trip or any other trip in 2019. Jill Briscoe. Her wit and wisdom make her a speaker you do not want to miss. Incoming 6th-12th graders, join the Youth Groups for a few days away to learn about "The Narrow Way." Register by 5/26 to get a discount ($165). Deadline to register at the full price ($180) is 6/16. Cornerstone will be taking a trip to Greece with a cruise as well covering the footsteps of Paul. Come and celebrate Easter at Cornerstone as we look at how Jesus made us alive through His Resurrection from the dead. Join us for our annual FREE Fish Fry & Good Friday Service with games, prizes, inflatables & lots of free food, not just fish. It’s a great event to invite your friends and family to. Join us during our regular Midweek Service for a Communion Service focused on the Passover. Join us for a time of fellowship and food (pizza and soda for sale) and a new animated movie that is just released of "The Pilgrims Progress." Take the challenge to step outside of your comfort zone, share the gospel and invite someone to Easter Services. Who you are is more than who you are with... a conference for young people to discover their identity in Christ. Come hear Tom Doyle, a ministry to the Middle East, as he shares at both Sunday Morning Services. There will be a private pre-screening of the movie Unplanned, a movie about abortion and a transformed life at the Xscape Theatres in Howell. Click here for more Info. Plans for VBS have begun, we want to invite more of you to join our drama team for VBS, so if you are interested in being a part of the team, come to this meeting. 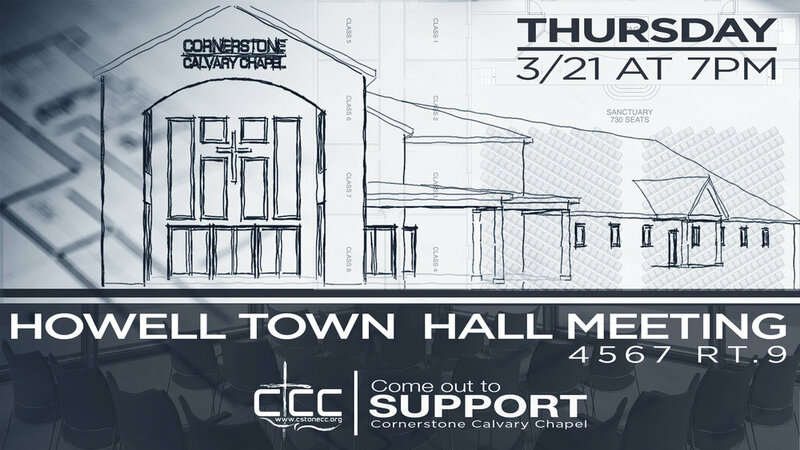 Show your support by coming out to join us for the Howell Town Meeting. Enjoy a Corned Beef lunch and a challenging teaching. There will be an interest meeting just before youth group for those interested in going on this trip 8/5-8/10. Join us for this time of fellowship and prayer for the whole family at our monthly BUILT Gathering. Young adults, don’t miss REFRESH Live, a great time of fellowship, live music and coffee. Come to this meeting if you are praying about or interested in going on this trip May 21-28. Join us for our monthly BUILT Gathering, with a soup potluck. Join us for this time of fellowship and prayer for the whole family. • Sunday, 1/13 @5pm: Pray for an awakening in our vision as a church for 2019. • Monday, 1/14 @7pm: Pray for an awakening in missions & missionaries. • Tuesday, 1/15 @7pm: Pray for an awakening in the ministries of our church. • Wednesday, 1/16 @7pm: Pray for an awakening in relationships. • Thursday, 1/17 @7pm: Pray for an awakening in Howell, NJ & our nation. • Friday, 1/18 @7pm: Pray for an awakening in the next Generation. • Saturday, 1/19 @9am: Pray for an awakening in the Sanctity of Life. Men, love to eat, fellowship, swim and play sports. Join the Men's Fellowship at Keswick May 10. All ages welcome for food, fellowship, live music and coffee at this Holiday REFRESH Live. Celebrate Christmas with the youth during the regular youth group time, with music, gingerbread houses and Christmas cookies. Celebrate Christmas with the young adults with food, fun and a white elephant ($5 gift) game at Kim's house. Address on the Awaken card at the Info Counter. Men sign up at the Info Counter to join the Men's Fellowship in celebrating Christmas together. A night of Christmas Music Old & New by Cornerstone Worship.